Giant cell tumor (GCT), also known as osteoclastoma, is a benign, locally aggressive tumor that is histologically composed of two components, osteoclastic giant cells admixed with mononuclear stromal cells. The typical age of presentation is 20–45 years with a slight female preponderance, although few cases have been reported in the first decade. GCT commonly affects the distal femur, proximal tibia, distal radius, and proximal humerus. Pelvis, sacrum, and bones of hand and feet can be rarely involved. The patients present with pain and swelling of the involved joint. Radiologically, it presents as a lytic expansile lesion, without peripheral bony sclerosis. This lesion is locally aggressive with remote chances of distant metastasis. Malignancy arising in a GCT is uncommon, usually high grade, and is either primary or secondary. Local recurrences are known. Spontaneous regression of tumors, a phenomenon attributable to activation of immune system, is defined as complete disappearance of primary tumor or its metastasis in the absence of any treatment. It has been reported in melanomas, basal cell carcinomas, testicular germ cell tumors, renal cell carcinomas, neuroblastomas, breast and colon cancer, and very rarely in osteosarcoma and aneurysmal bone cyst., Spontaneous regression of GCT is extremely rare. Here we report a case of spontaneous regression of GCT of the distal radius in a 21-year-old male who had not received any prior therapy. A 21-year-old male presented with pain and swelling since 3 months with limitation of the movement of left wrist joint. An X-ray was done, and an expanding and eccentric area of lysis was seen in the epiphysis [Figure 1]a. Simultaneously, a fine needle aspiration cytology was done from the swelling; the Giemsa-stained slides comprised cellular smears with minimal hemorrhage and were composed of dispersed and clusters of mononuclear spindle cells and multinucleated osteoclastic giant cells. The giant cells were seen attached to the periphery of the spindle cell clusters. There was scant amount of blood in the background [Figure 1]b. Based on the location of the lesion and cytology, GCT, aneurysmal bone cyst, brown tumor of hyperparathyroidism, and giant-cell-rich osteosarcoma were considered as differentials. Aneurysmal bone cyst was excluded as the lesion was confined to epiphysis and the background was devoid of hemorrhage, fibroblasts, and hemosiderin-laden macrophages. Parathormone levels were within normal limits, hence brown tumor of hyperparathyroidism was excluded. There was absence of atypical cells with lack of osteoid, hence osteosarcoma was ruled out. A possibility of GCT was suggested. His blood profile and chest X-ray were normal. The patient refused any treatment. Clinically, there was a mild decrease in the size of the swelling. 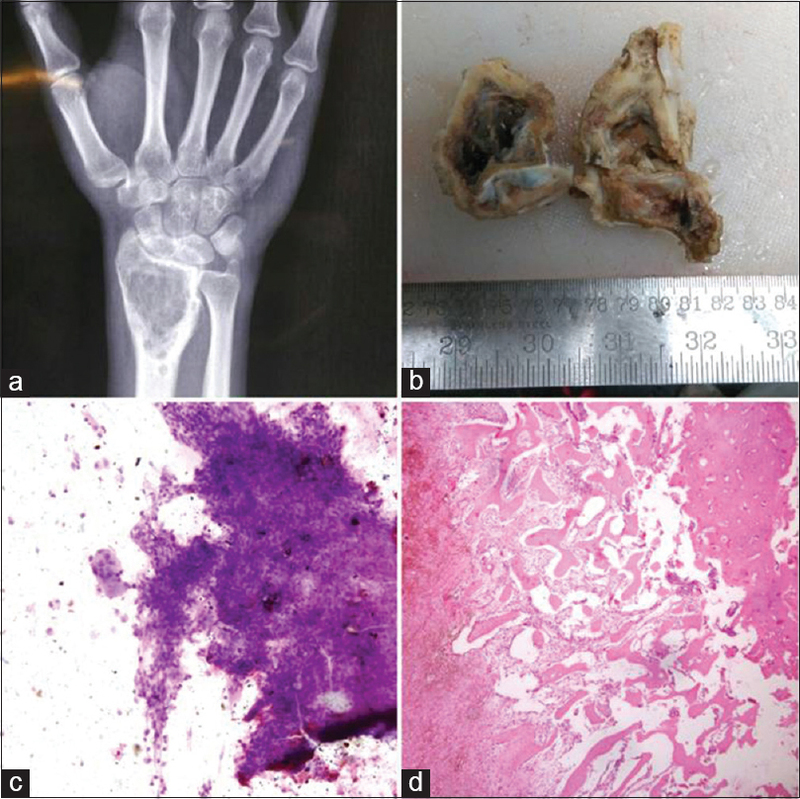 The patient was initially reluctant for surgical treatment, and only after 8 months a wide local excision along with reconstruction was performed around the left wrist and the tissue was sent for histopathology. Grossly, the specimen measured 7 × 5 × 3 cm; involved the lower end of the radius; and showed a grey brown, hemorrhagic lesion measuring 3 × 2.2 × 1.5 cm reaching up to the cartilage [Figure 1]c. Multiple microscopic sections were taken from the lesion and all revealed chronic inflammation comprising of lymphocytes, plasma cells, and histiocytes with few entrapped fragments of necrotic bone, focally surrounded by new woven bone beneath the cortical bone [Figure 1]d. The inflammation was focally breeching the cortex involving the periosteum and was limited by the articular cartilage distally. No evidence of GCT was seen in the multiple sections examined exhausting the entire lesion. GCT is a painful lesion of the bone that is caused by imbalance of the RANK ligand and RANK osteoprotegerin (OPG) cascade which creates an imbalance between bone formation and bone reabsorption. Histologically, it is composed of osteoclastic giant cells with mononuclear stromal cells. In the present case, an intralesional curettage from the swelling after 8 months showed no evidence of GCT. The patient had not taken any chemotherapy/radiotherapy. Spontaneous regression of tumors which happens in the absence of treatment is attributed to numerous factors, namely, immune mediation, inhibition of tumor cells by cytokines, hormones, or growth factors, tumor necrosis, or inhibition of angiogenesis or differentiation. Spontaneous regression has been recorded in neuroblastoma, retinoblastoma, hepatocellular carcinoma, melanoma, and osteosarecoma. Differentiation of the tumor seems to be the cause for regression in neuroblastoma; ischemic necrosis or calcification may be responsible for retinoblastic regression. Tumor hypoxia could play a role in spontaneous regression of hepatomas, whereas immunological mechanisms interact and bring about regression of melanoma and osteosarcomas. Regression in primary associated with development of metastasis metachronously or synchronously has been described in melanomas and osteosarcomas. Phenomenon of spontaneous regression is extremely rare in GCT with Kay RM et al. reporting one case. Dietrich et al. described histological regression of lung metastasis in a 37-year-old patient with femoral GCT following treatment with denosumab, which is a RANK ligand inhibitor. This drug inhibits bioavailable RANK ligand, thus reducing osteoclastic activity. There is reduction in vascularization along with influx of immune cells. All these factors contribute to regression of the tumor following chemotherapy. Similar histolological features were seen in our case with the absence of giant cells and mononuclear cells; recruitment of lymphocytes and plasma cells puzzles us. Is this phenomenon due to alterations in RANK OPG signaling cascade? This remains a mystery, and unraveling this mystery might provide new insights for treatment. Kay RM, Eckardt JJ, Seeger LL, Mirra JM, Hak DJ. Pulmonary metastasis of benign giant cell tumor of bone. Six histologically confirmed cases, including one of spontaneous regression. Clin Orthop Relat Res 1994;302:219-30. Song R, Gu J, Liu X, Zhu J, Wang Q, Gao Q, et al. Inhibition of osteoclastic bone resorption activity through osteoprotegerin – Induced damage of the sealing zone. Int J Mol Med 2014;34:856-62. Papac RJ. Spontaneous regression of cancer: Possible mechanisms. In Vivo 1998;12:571-8. Dietrich MF, Cavuoti D, Landay M, Arriaga YE. Histological regression of giant cell tumor of bone following RANK ligand inhibition. J Investig Med High Impact Case Rep 2014;2:2324709614560216.